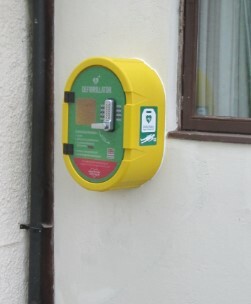 The Parish Automated External Defibrillator (AED) is located outside the village hall and is available for use 24/7. In a medical emergency always ring 999 immediately for the Ambulance Service. If a defibrillator is needed, the Ambulance Service will tell you where the nearest defibrillator is located and give the cabinet door security code to access the defibrillator.